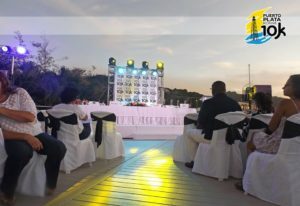 If you’d like to gather valuable information as Lifestyle Holidays Vacation Club reviews details for this year’s Puerto Plata 10k Race, be sure to attend a press conference and cocktail hour that will be held June 27 at Café Del Mar inside the DOME complex, which is part of the Puerto Plata resort. The Puerto Plata 10k Race will take place September 9 and Lifestyle Holidays Vacation Club president Markus Wischenbart is proud to be hosting what is sure to be yet another great event. Now in its fourth year of operation, the Puerto Plata 10k race is an annual 10-kilometer run that is carefully planned and executed with the goal of offering a safe and memorable experience in mind. The event’s main objective is to promote physical activity as a fundamental part of a healthy lifestyle. In order to prepare participants for this race, the Puerto Plata resort offers training programs for different levels of runners. The race is also intended to showcase Puerto Plata as a sports tourism destination. The race’s route, which includes the boardwalk and main streets of the historic center, allow runners to tour Puerto Plata in a unique and exciting way. Locals and tourists alike can participate in this event and appreciate the city from a different point of view. Our committee organizer, Puerto Plata Corridor Club Korre a Mil, was founded in October 2013 and is comprised of a dedicated group of people who are passionate about running and eager to share the benefits of the sport. They have worked toward their goals with various sports programs and institutions over the years. 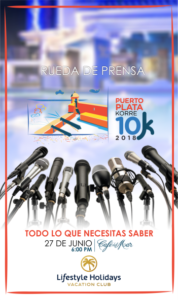 For more information regarding the Puerto Plata 10k Race, be sure to attend the press conference and cocktail hour June 27. For further inquiries, contact the event’s coordinators by writing to Road Luperon KM 3, Plaza El Doral, local No. 2 Puerto Plata, Rep. Dom., or email ptoptakm@gmail.com. You can also call 829-589-1000.